Château d’Anglure ... did the desire to acquire a title inspire Joseph Comerford’s extraordinary pedigree? In 1724, Joseph Comerford of Clonmel, Dublin and Anglure [see 9: Joseph Comerford (d. 1729), Marquis d’Anglure], registered a pedigree with the Ulster King of Arms, William Hawkins, claiming descent from the Comberfords of Comberford, Staffordshire, and providing a fantastically imaginative pedigree for the Comerfords of Co Kilkenny. A year later, Joseph Comerford erected a plaque in the Comberford Chapel in Saint Editha’s Church, Tamworth [see Comberford 6: ‘A family brought low …’]. Most of the pedigree is without foundation, and it is a work that weaves little fact with the most misleading yet imaginative and bizarre claims. The sharpest critique of the claims in this pedigree came over a century ago from the genealogist George Dames Burtchael, who scrutinised it while he was working in the Ulster Office of Arms in Dublin Castle as Athlone Pursuivant and then Deputy Ulster. In a pencilled note written across the first folio of the Comerford pedigree, Burtchaell declared forcibly: “All this is pure and unadulterated rubbish. [… illegible] GDB.” His critical notes on the Comerford pedigree are hardly unkind when we consider the fictitious confection that is this pedigree, the bizarre creation of an early 18th century fantasist. There are ten generations and 220 years between the fictitious Allen de Comberford, who is said to have died in 1504, and Joseph Comerford, who registered the pedigree in 1724, or an average of 22 years for each generation, which is highly improbable and totally unbelievable. But even more startling is the claim that Richard Comberford, who was living in Staffordshire in 1547, married a niece of Bishop Edmond Comerford of Ferns, who died in 1509, and was the direct ancestor of Joseph Comerford, who registered this pedigree in 1724 – an unbelievable and impossible average of less than 15 years for each generation over a span of 177 years. A substantial part of the pedigree is based on the registered pedigrees of the Comberfords of Comberford from the Visitations of Staffordshire and Warwickshire. Indeed, it is this clever interweaving of fact and fiction that makes the pedigree and Joseph Comerford’s work so credible for his contemporaries, so deceptive for later generations, and such a minefield for genealogists who approach it today. The supposed immediate Comberford ancestor of the Irish Comerford family was, according to this pedigree, Judge Richard Comberford (ca 1512-post 1547), second son of Thomas Comberford who died in 1532 [see Comberford 4: Comberford wealth from Wednesbury], and his wife Dorothy Fitzherbert. However, Richard Comberford was, in fact, the ancestor of the Bradley branch of the family. He was born ca 1512. With his brothers, Canon Henry Comberford and Humphrey Comberford, he was educated at Cambridge (BA 1534, MA 1537, Fellow of Saint John’s, 1534). A senior barrister, Richard Comberford was a serjeant-at-law or servillus ad legem, according to the Visitation of Staffordshire. He held one of the highest judicial posts as the King’s Remembrancer from about 1547. He was also a Ranger of Hatfield Close. Richard Comberford married Isabel Biggs. In Lichfield in 1530, as “Dame Isabella Cumberforde,” she was admitted to membership of the Guild of Saint Mary and Saint John the Baptist while her brother-in-law, Humphrey Comberford, was Master of the Guild. [see Comberford 4: Comberford wealth from Wednesbury]. 4, John Comberford, whose daughter Alice married Walter Littleton. [however, see 4: Comberford wealth from Wednesbury]. Joseph Comerford’s pedigree registered in 1724, and the pedigree compiled at the College of Heralds in London in 1786 for the Countess of Crequy, make an even more fantastic claim, saying Richard moved to Ireland and became Lord of Ballymacken and Danganmore, Co Kilkenny, through his marriage to Mary, daughter and heiress of Allen de Comerford, last Baron of Danganmore, said to have died in 1504, and niece of Edmond Comerford, Bishop of Ferns, who died in 1509. As Richard Comberford was still living in Staffordshire in 1547, such a marriage is an impossibility, for this would leave twelve generations between Richard’s death, many years after 1547, and Joseph Comerford’s death in the 1729 – an average of less than 15 years for each generation over a span of less than 180 years. With such bizarre possibilities, it is natural to ask why this pedigree should be given any consideration at all. 1, It has influenced other accounts of the history of these families, in particular the claims that the Comerfords of Ireland were the descendants and heirs of the Comberfords of Staffordshire. 2, It consolidated many of the myths about the Irish family, including the notion that the head of the family held the title of Baron of Danganmore. 3, It has sown the seeds of confusion, and needs to be unpicked at various stages. Why did Joseph Comerford go to so much trouble to draw up, register and convince others of the veracity of such a pedigree? 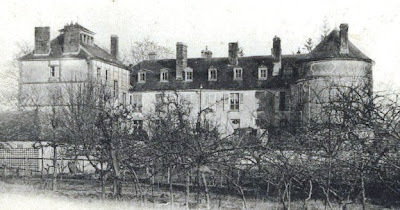 Without a convincing noble pedigree, Joseph Comerford could not have acquired a French noble title when he bought the Chateau and estate of Anglure. 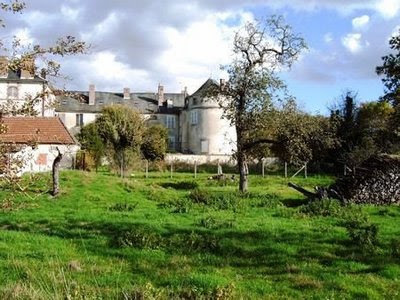 Indeed, we might ask whether he would have ever bought the chateau in the first place if there was no title to go with it, for its purchase and the costs of maintaining it eventually bankrupted his branch of the family. On the other hand, Joseph was not the first Irish Comerford to have believed that this family was descended from the Comberfords of Staffordshire and to have believed in those ties of kinship: Nicholas Comberford, the Stepney mapmaker, used the Staffordshire spelling of the name throughout most of his career although he was originally from Kilkenny [see Comerford Profiles 6: Nicholas Comberford (ca 1600-1673), 17th-century cartographer]; and his contemporary and kinsman, Patrick Comberford, adapted a variation of the Comberford coat-of-arms when he became Bishop of Waterford and Lismore [see Comerford Profiles 5: Patrick Comerford (1586-1652), Bishop of Waterford and Lismore], so that the quartered arms of the Comberford and Comerford families, which have long been used by the Ballybur and Danganmore branches of the family, predate the fantasies of Joseph Comerford. Joseph Comerford visited the Comberford chapel, and presumably visited Comberford Hall too at least on one occasion after he acquired his estates in Anglure and the title of Marquis d’Anglure, but his familiarity with the family history of the Comberfords of Staffordshire and the information from Sir William Dugdale’s Visitation of Staffordshire in 1663, indicate he may have visited earlier, and it is likely that he was not the first Irish Comerford to visit Comberford and the Moat House in Tamworth. Despite its bizarre, fictitious, fantastic claims, there is a romantic side to Joseph Comerford’s family tree. And so this pedigree, in its own charming way, serves to emphasise how by the late 17th century and the early 18th century the Comerfords of Ireland totally identified themselves with the Comberfords of Staffordshire, and had forged strong ties of kinship and affinity. Rich[ar]d de Comberford 2d son Ld. of Ballymacken & Danenmore [married] Mary D[aughter] & H[eiress] of Allen de Comberford [see Table 2]. Roger de Comberford of Staffordsh[ire] came into Ireland with King John & was Great Master of the Game. He took new Armes as many of the English did that settled in Ireland. Richard de Comerford, Eldest son [see below]. Edw[ar]d de Comerford, 2d son [see below]. Henry de Comerford, 3d son [see below]. Edward [Comerford,] ArchB[isho]p of Cashell [sic]. Joseph de Comerford Esq now living in the City of Dublin Ao 1724 [married] Margaret Browne of the House of Comins, Com [i.e., county] Limerick. Bonaventure de Comerford, 2 son. Luke de Comerford, 3d son, mar[rie]d in France. George de Comerford, 2d son. There are two marginal entries on fol 103. Azur[e] a Buglehorne A[rgent] stringed Gules bet[ween] 3 Mullets O[r]. Supported on each side by an Irish wolfedogg brown & white. Crest a Peacock in his pride P[rope]r. Motto So ho ho Dea ne. 3d as 2d. 4 as 1st. Crest a Peacock’s head out of a Ducall [sic] Cro[wn] P[rope]r.
4ly, G[ules] on a Cross engr[ailed] O[r] 5 red roses p[rope]r.
The Armes last Depicted were Borne by Richard de Comberford who on his marriage with Mary Da[ughter] & H[eir] of Allen de Comerford Quartered her Armes with His, omitting the Supporters, Supporters being then used only by Peers, which Armes & Quartering & Crest are now borne by his Descendant Joseph de Comerford of the City of Dublin. William Hawkins jr (1670-1736) was Ulster King of Arms from 1698 to 1725, having succeeded his father, William Hawkins, who held office until 1722. Al Cantab, 1/1, p. 432. This appears to be Alan de Comberford, son of Alan de Comberford, who claimed Wigginton Manor in 1278 but he was sued by the Marmion family for £10 in damages caused in fields in Coton and Wigginton, two villages within a mile of Comberford. This is Roger de Comberford who was living in 1256, 1266, 1286 and 1291. He was living in was living in 1313, 1327 and 1329. This William Comberford died in 1349. The pedigree does not name his wife Alice. He was living in 1386, and probably died before 1391. She was a widow by 1389. He was Lord of Comberford in 1414, 1422, 1424, and 1429-1436. He died ca 1436-1439. He was born ca 1403/1410, built Comberford Hall in 1439, and died on 11 June 1472. Anna or Anne Comberford was the daughter of Robert Browe, MP, of Teigh and Woodhead, Rutland, and the widow of John Heliwell of Whissendine, Rutland. When she was widowed, she married her third husband, William Newport, of High Ercall, Shropshire, High Sheriff of Shropshire in 1473. He was born ca 1426, was living in Lichfield in 1476, had succeeded to his father’s estates in Comberford and Tamworth by 1478, and died in 1508. Johanna Comberford was the only daughter and heir of John Parles of Watford and of Shutlanger, Northamptonshire. He was born before 1472, was living in Lichfield in 1495, succeeded to his father’s estates about the age of 36, and died on 6 January 1532. Dorothea Comberford was a daughter of Ralph Fitzherbert of Norbury, near Ashbourne, Derbyshire. Humprey Comberford was born ca 1496/1498, was living in Lichfield in 1530, succeeded to his father’s estates in 1532, and died on 23 December 1555. Dorothy Comberford was the second daughter and co-heir of John Beaumont of Wednesbury, Staffordshire; she died in 1565. Richard Comberford was born ca 1512 and died after 1547. Here Burtchaell has added a pencilled note: ‘will 11 June 1711, pr 1719. (c) Patrick Comerford, 2009, 2011; last revised, 11 and 12 January 2011; 18 May 2011; 27 October 2015. Interesting post Patrick. Am I understanding correctly then that there is no accurately documented connection between the Comerford's of Co. Kilkenny and the Comberford's of Stafforshire? That's right Kevin. The Staffordshire link is a myth that was accepted by both families, and one that is perpetuated in popular books on Irish family names. But the Irish Comerford family roots are in Quemerford in Calne, Wiltshire. I'm a regular visitor to both Quemerford and Comberford, both charming places. I suppose, though, you could say the perpetuation of the myth leaves ties of kinship one that is like adoption. Find your way around this blog, and you'll see the full story.